I think we all need a positive uplift at some point. Well, Chicken Soup for the Soul: Think Positive for Kids – 101 Stories about Good Decisions, Self-Esteem, and Positive Thinking by Kevin Sorbo and Amy Newmark is the perfect thing to give you an uplift and a positive attitude. This book is for kids of all ages. I’m sure no matter how old you are you will benefit from this book. We all have periods in our life when we have a hard time remaining upbeat, making good decisions, and keeping a positive self-esteem, especially when you are young. Children and teens are just beginning to come into themselves, and to make their own decisions. They still see themselves as a reflection of how others see them, which it makes it harder to have good self-esteem. By reading this book, it may help them realize that being positive and having good self-esteem comes from within, and that nothing lasts forever. It will also let them know that they are not alone. While no one has their exact life experiences, many go through similar experiences and survive and even excel. They need to know that anything is possible. I love the story, “It’s Okay to Fall”. It’s funny how a story about learning to skate relates to life in general. The passage – “When you start to fall, relax and go on down. If you struggle to keep from falling you’ll be more likely to hurt yourself” can be used on any situation in life. I never really looked at things this way. The author realizes that this goes for everything in life as she grows up. “As long as I kept trying to do my best, I could learn something even when I failed. I could get back up, try again, and trust God would be there to help me – not only with roller skating but with everything in life.” We all need to realize this. You almost always learn more, whether you realize it or not at the time, when you “fail” or “lose”. Great discoveries are made when experiments “fail”. I highly recommend this book, Chicken Soup for the Soul: Think Positive for Kids – 101 Stories about Good Decisions, Self-Esteem, and Positive Thinking. These books make great gifts, especially for those hard to buy for people. If you are not ready to purchase a copy, or you would like another copy for someone else, you can try to win one. 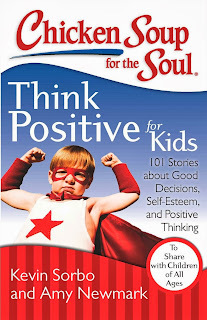 Check out my giveaway post where I am giving away 3 copies of Chicken Soup for the Soul: Think Positive for Kids – 101 Stories about Good Decisions, Self-Esteem, and Positive Thinking.